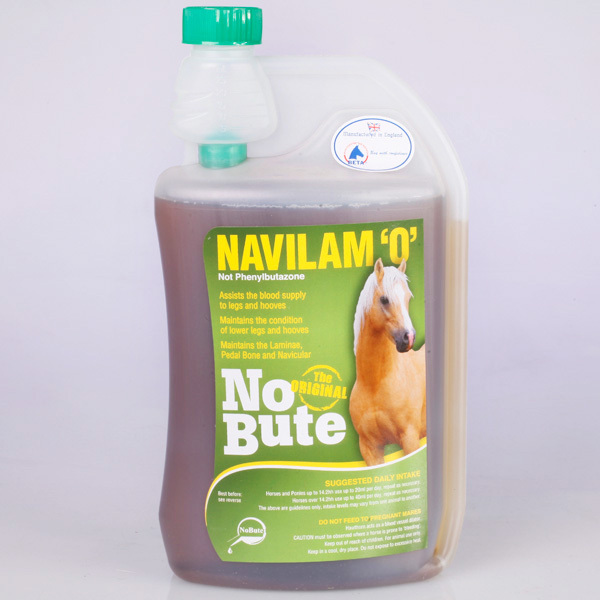 Effective phytotherapy for the Laminae, pedal/navicular bones, lower legs and hooves, Navilam 'O' is a complex and modified variant of No Bute. Navilam 'O' is a Phenylbutazone-free nutritional feed supplement developed to contain the key nutrients for optimum bone and cartilage growth as well as joint restoration, repair and maintenance. Contains natural extracts including English Hawthorn for increased potency. Extract of Harpagophytum Procumbens (Devils Claw). Crataegus (Hawthorn), L-Ascorbic Acid (as antioxidant), Propionic Acid E280, Acetic Acid E260 (as preservatives). Horses and Ponies under 14.2hh to use up to 20mls per day, repeat as necessary. Horses over 14.2hh use up to 40ml per day, repeat as necessary. The above are guidelines only, intake levels may vary from one animal to another. DO NOT FEED TO MARES IN FOAL - Hawthorn acts as a blood vessel dilator. Below are some recent questions we've received regarding No Bute Navilam 'O' for Horses, including answers from our team. Would this be suitable for a pony with navicular? I have a 14.2 connemara gelding he is rising 9 this year and has had navicular for a year and a bit. This supplement contains natural anti-inflammatory ingredients which are likely to make your horse more comfortable but do not necessarily support ongoing joint health. I would suggest a supplement such as Yumove Horse, GWF Nutrition Joint Aid Plus or Equistro Flexadin which contain good quality ingredients designed to promote joint health. It is possible that you could use a supplement containing Devils Claw such as Navilam too if you feel he needs a little extra help but I would start with one of these and see how he goes. How much devils claw is actually in this ? Ratios? Please could you show quantities on all the devils claw products so that a fair comparison of products could actually be made? Your question is very reasonable, but would only give part of the answer. We will investigate this further and hopefully publish the result on the website. There is a difficulty here because these products usually contain a mixture of ingredients and the types and ratios vary between them all. Any therapeutic effect which might derive from any particular plant ingredient can be increased by the inclusion of other ingredients. Then the effect from any one plant can be affected by the growing conditions of the plant, the parts of the pant used and their age and stage in the growing season, then also by the way the plant is processed after harvesting. The active components within the plant can be digested, absorbed and used by the horse to very varying extents depending on all these factors. Licensed medications are carefully standardised and all of these things are controlled and effectiveness has been measured and evaluated. Information on non-licensed supplements is largely lacking. Such as there is, is mostly provided by the manufacturers and so is not impartial. The best advice generally is to choose products from well known manufacturers who have a reputation to maintain. You also tend to get what you pay for, so the higher cost products are more likely to contain higher quality and quantities of ingredients. For the moment, that is the best advice which can be given.